Although this blog is dedicated to our journey with Grace, every once in awhile, Grace's mommy and daddy need some time on their own. And we are very blessed that both of our families live so close and are always willing to help us out. Shortly after Grace was diagnosed, Kyle and I were doing some Christmas shopping, when I happened on a post by the Avett Brothers on Facebook. They were announcing three summer concert dates at Red Rocks Park, just outside Denver. My brother and his wife used to live in Colorado and have told us many times what a phenomenal venue it is to see a concert. The clincher for Kyle was the opening act on Saturday, featuring another of his favorites, Sturgill Simpson. Hanging out at Coors Field, watching the Rockies beat the Braves. He was ready to go for it and pull the trigger, but I was a little nervous. We had just gotten Grace's diagnosis, and I wasn't sure how she would be doing seven months down the road. But Kyle was very encouraging and said we could always cancel the trip when the time came if we didn't feel like we could leave Grace for that long. So, we used our Christmas money to purchase the VIP experience tickets to one of our very favorite bands, the Avett Brothers. I still wasn't sure we would actually go to the concert, but we were both still excited. 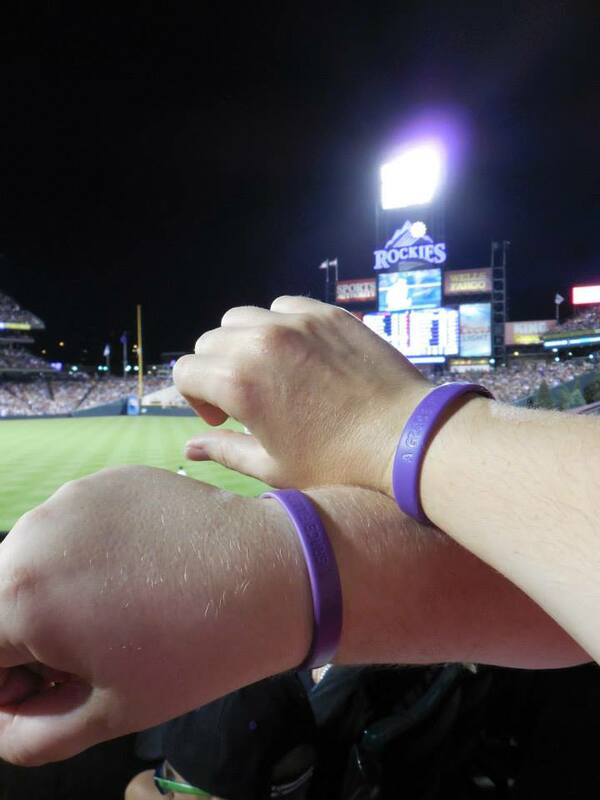 Rocking our Gracelets at Coors Field. Several months ago, we started looking at airfare and hotels, making it all the more real. Mom agreed to watch Grace for the weekend, and we were set. We began looking at what else we could do in Denver while we were there. One of our favorite things to do on trips is visit other Major League Baseball stadiums. We checked and the Rockies just happened to be in town that weekend, so we were planning to do that on Friday night. As a treat, my brother and his wife got us the baseball tickets for our birthdays in May! 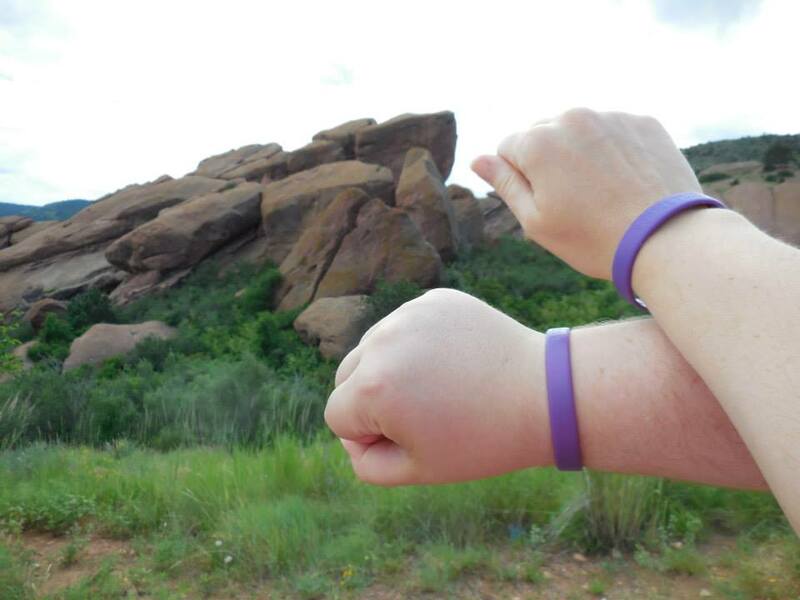 Rocking our Gracelets at Red Rocks Park. So, we had our plans, and our tickets, and all that was left was leaving for our trip. We left bright and early on Friday morning, so we would have at least part of the day to explore Denver. When we arrived at the airport, we managed to get through security in plenty of time to pick up a People magazine and some candy for the plane ride. As we were sitting at our gate, they announced they had overbooked the flight and were in need of volunteers to take a bump. They were offering $300 in travel vouchers, so we went to check it out. They could still get us into Denver late in the afternoon, and by the time they refunded our ticket price, we ended up with almost $900 in travel vouchers. So, we're saving it up for our next trip! With the bump, we were rerouted for a short layover in Dallas, and still arrived in Denver around 5. We picked up our rental car and headed into the city for the game. 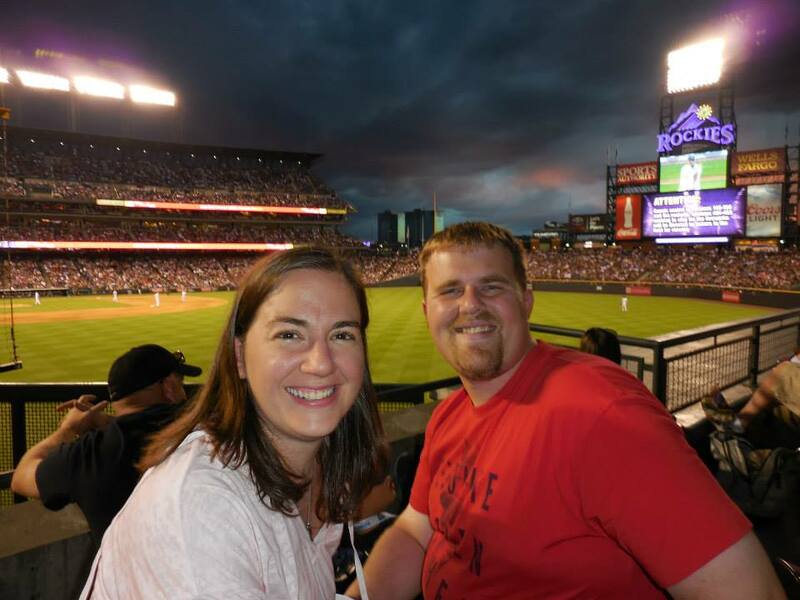 Finding a parking spot in downtown Denver proved to be a little harrowing, and we were a little late to the game, but we had such a great time exploring the stadium. And it was a perfect night to watch the Rockies beat the Braves. We even discovered some of our new favorite ballpark Jumbotron games, like "player or primate" and "Finding Sasquatch." 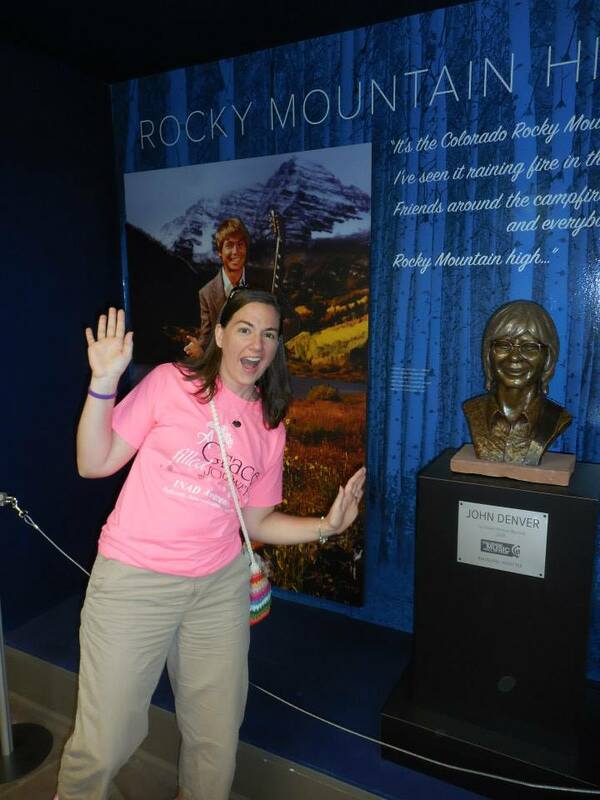 Just hanging out with John Denver. They were scheduled to have fireworks that night, but a storm rolled in, delaying the display. We opted to stay dry and make our way to the hotel. And after stopping at 7-11 for some hotel room snacks, we checked into our hotel. It had been a long, but very nice first vacation day. And we started to discuss what we wanted to do the following day before the concert. We talked about the Denver Art Museum and some other famous sights. But neither of us wanted to fight the city traffic again. instead, we opted to spend part of the day in, and take a break from all the running. 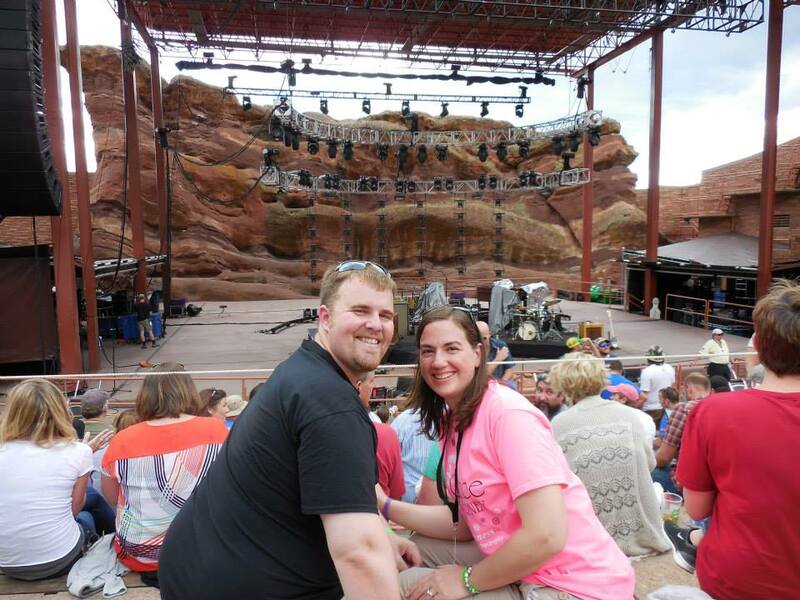 We wore our Grace Filled Journey shirts to the concert, and were about five rows from the stage. We slept in, ordered room service for breakfast and relaxed in the hot tub before making our way to Red Rocks Park. Since we arrived several hours before the concert, we had a chance to walk around and look at the natural beauty in Red Rocks Park. We also wandered around the Colorado Music Hall of Fame and had lunch in the park. Since we purchased the VIP tickets, we got our tickets in the afternoon and early admission into the concert. They had a pre-party with a variety of food, and a chance to talk with other fans. We weren't the only ones who traveled for the show, as we sat with people from Oregon, Pennsylvania and Georgia among others. The tickets also included a special section of seats, starting about five rows back from the stage. 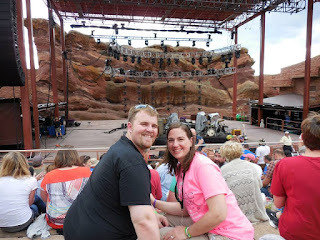 So, we enjoyed a little bit of food, and then made our way to some awesome seats for the show. Rainbow over Red Rocks during Sturgill's set. Sturgill Simpson, who Kyle had seen before, opened the show with a great set. About part way through his set, a beautiful double rainbow just appeared over the sky, almost like it was meant to be that we were there. Kyle and I were pretty proud to be wearing our Grace Filled Journey shirts to the show as well. 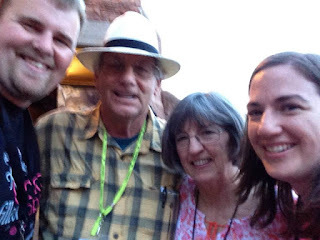 As we were visiting with some of the fans around us, one couple pointed out the parents of Scott and Seth Avett, who were greeting fans off to one of the sides. Kyle told me I should go over there, but I was so nervous. So, we went together. Kyle introduced himself, and they were delighted to talk with us. They were so kind and allowed us to share our Grace with them. Before we left, Mr. Avett told Kyle, "you don't always like the cards, but you play the hand you're dealt." And we wouldn't trade our Grace card for anything. Just hanging out with Mr. and Mrs. Avett. It was one of the highlights of the show for us. As the band took the stage, it marked the fifth time we had seen them. We saw them twice before in St. Louis, once in Peoria and one other time for our anniversary in Wisconsin, the only other weekend we've ever been away from Grace. And the show definitely didn't disappoint. They played some of our favorites, like "Kick Drum" and "Murder in the City," as well as some other songs that just might make our new favorites list. 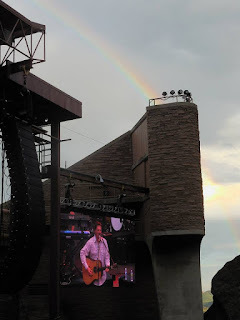 In all three nights at Red Rocks, the band never played any repeat songs. Many fans made sure to get tickets for all three nights, something we think would be fun someday. We found ourselves up dancing and singing nearly the whole evening, just enjoying our time together. While we love the opportunity to take Grace with us for family events, every once in awhile, it's nice to have some time to ourselves, where for just a short while, we can put the worries of the world up on a shelf, and remember how it was that we fell in love in the first place. 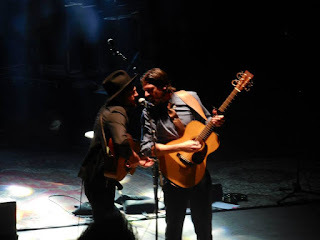 The Avett Brothers will always be one of our very favorite bands. Our flight home left bright and early on Sunday morning, bringing us back to the reality of our journey. Neither of us could wait to see that big, bright beautiful smile waiting for us when we got home. We even took that Sunday night off work so we could spend some extra time with our sweet Grace. With a little bit of swimming, we enjoyed our evening back together. Although our weekend away was wonderful, there truly is no place like home, back with the snuggles of our favorite little girl. And as the Avett Brothers sang that night, "Always remember there is nothing worth sharing like the love that lets us share our name."